IS Decisions has launched the first online game designed specifically to educate and raise awareness of user security and insider threat. ‘The Weakest Link: A User Security Game’ has been developed as a free resource for organizations in response to our own research that found 48% of IT professionals believe training is key to raising awareness of user security, whilst 38% wanted to see more innovative training content and materials. The game is now public, following an initial private beta period, during which time the contents have been developed with input from security experts and analysts including Bob Tarzey at Quocirca, Independent Advisor Neira Jones, Christophe Veltsos of DrInfoSec.com, Peter Bance of CLAS Consultancy, Jay McGowan of Moonbird and Paul Drury of Chatback Security. Input has also been sourced via the community on IT social network Spiceworks. Taking a question and answer format similar to a ‘choose your own adventure’ style, the game tasks its players to make it through their first month at a new imaginary employer without too many security ‘slip ups’. A different scenario is posed for each working day, with options for responses. Password requirements, file sharing, disgruntled contractors, phishing emails, lost devices, USB keys and pirated software are some of the challenges the user must face. The player then loses points for the choosing a non-secure option, or gains for making a secure choice. The aim is to survive the month without losing too many points. Any employee, in any position, from any department can play! User security is obviously a serious issue, but we know that it’s often a struggle to educate users on the issue through a dry security policy document or even a presentation. You have to hold their attention, so we came up with a way to try and do that. The idea is to bring a fun element to user security, sneaking some education into a game you can play in 20 minutes. That said, we didn’t want to develop ‘The Weakest Link’ (a play on the fact your users are your weakest link) in isolation. We want it to be a credible independent resource for IT people to use, which is why we’ve developed it with the input of analysts, experts and IT people themselves. It’s completely free to use, and we hope that IT people will share it with their users to play to try and drive awareness of the issues of user security and insider threat. 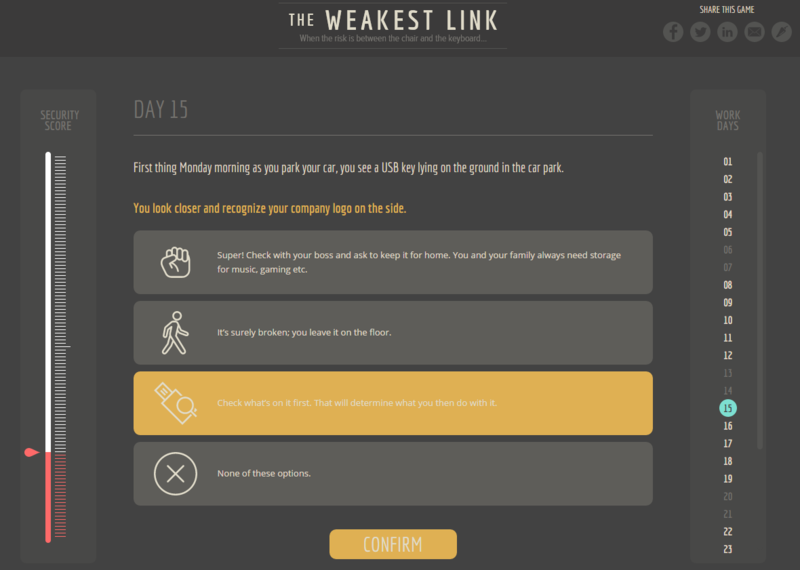 ‘The Weakest Link: A user security game’ is free to play on ISDecisions.com, where we are still gathering feedback for the continued development of the game. Please try it and feel free to share it amongst your users.